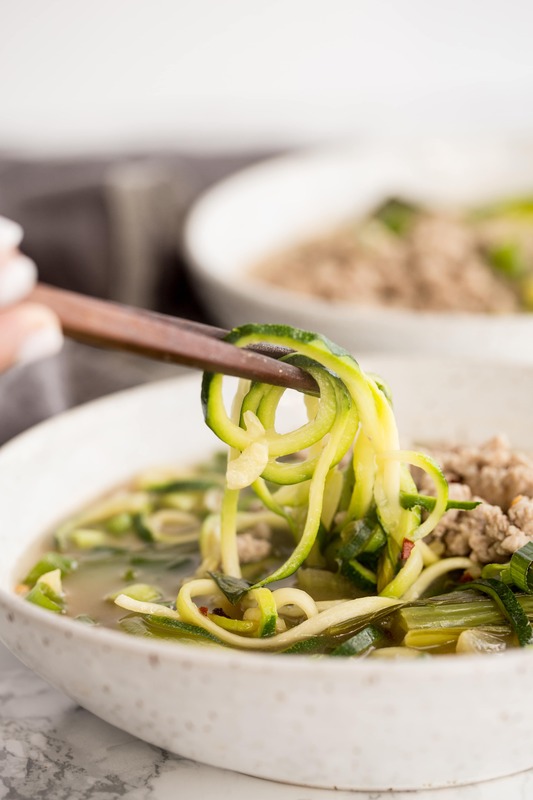 This easy ramen noodle dish uses spiralized zucchini in place of ramen noodles for the same exact texture and feel of ramen, but more nutritious and easier to make! The ramen is made with ground pork, miso, and spicy red pepper flakes for umami flavor! There’s nothing like a piping hot bowl of ramen, but I always am left feel overstuffed afterwards – it’s hard not to savor every last slurp! This traditional Japanese dish uses wheat noodles served in a broth, often flavored with soy sauce or miso, and uses toppings such as meat or veggies, like scallions. 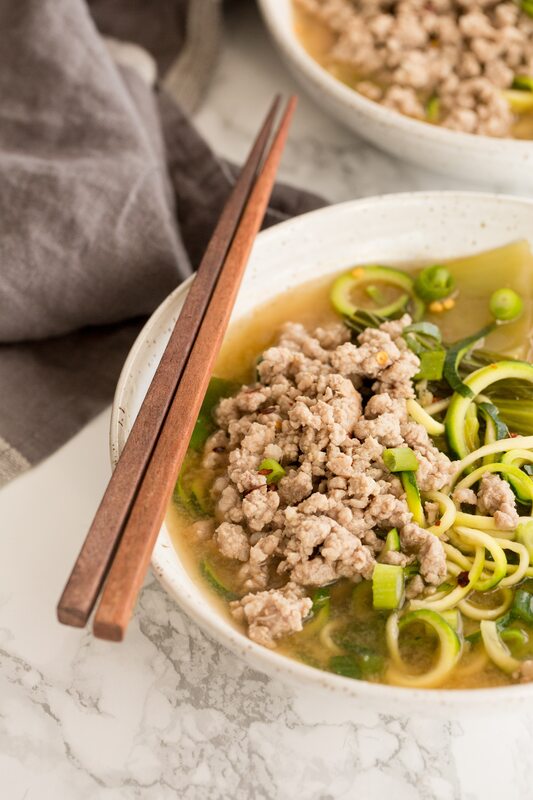 This version uses ground pork for an easy, tasty protein source – and is topped with lots of crunchy scallions and red pepper flakes for a spicy kick! Zucchini noodles are so easy to use as a replacement for any Asian noodle in noodle dishes. It absorbs the flavor of the broth, cooks perfectly al dente, and keeps its shape in a soup. You won’t believe you’re not eaten regular ramen, the consistency is exactly the same. A crumbled pork sausage or sliced pork tenderloin would be a nice tasty spin on this bowl, or if you don’t like pork altogether, you could use ground chicken or seafood. And if are vegetarian, try topping with some edamame and a soft boiled egg! A drizzle of sriracha goes a long way here, too. 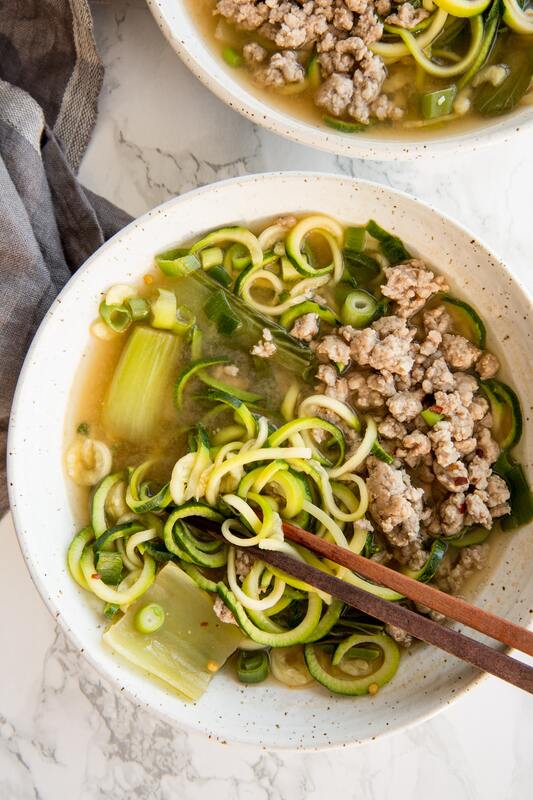 Since zucchini noodles release moisture, it can water down the broth of this soup. When reheating, I recommend adding an extra couple teaspoons of soy sauce to add saltiness and flavor back into the noodle dish. Reheat in a pot on the stovetop – bring to a boil and let simmer for a minute until heated through. Brown the pork in a large soup pot over medium-high heat until no longer pink. Remove with a slotted spoon into a bowl or plate and set aside. Once the oil is shimmering, add the garlic, ginger, and chili paste or flakes. Let cook for 1 minute or until fragrant. Add the bok choy, stir for 2 minutes to slightly wilt, and then add in the broth and soy sauce. Bring to a boil. Place the miso paste in a small bowl and add 1 cup of the boiling broth and stir well to dissolve the miso. Pour the miso broth back into the pot and stir. Reduce heat to medium-low and let simmer for 5 minutes for flavors to develop. Add the zucchini noodles, stir, and let cook for 3-5 minutes or until noodles are al dente. Stir in half of the scallions. Divide the soup into bowls and top with pork and remaining scallions. Add extra chili flakes if you dare. Serve. I am as on board with subbing veggie noodles for real ones to create healthier meals as anyone (own a spiralizer, have followed for a long time) but come on. You're going to say zucchini noodles have the exact same texture and taste as a ramen noodle? No one believes that and you shouldn't either. I'm also a long time follower, and I was thinking the same thing! Came out great. I used Imagine organic miso broth. I added some dried seaweed too.